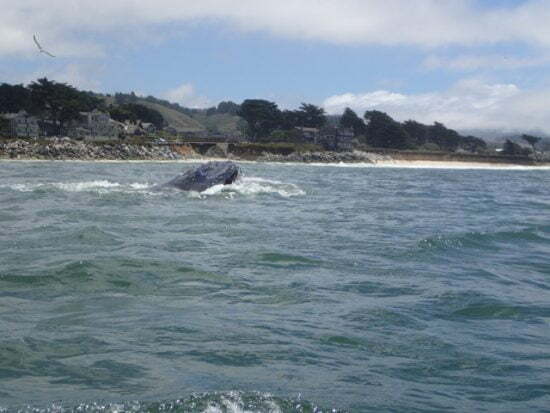 Near the end of June and during the first few weeks of July this summer large numbers of humpback whales were seen on a daily basis south of the Golden Gate Bridge, especially close to shore in Pacifica and Half Moon Bay, California. 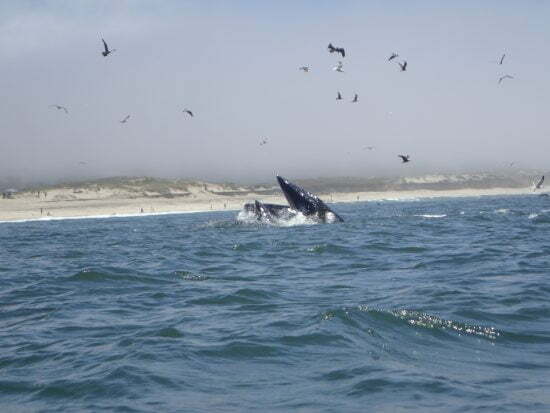 National and local television stations showed wonderful footage of this amazing gathering of humpback whales as well as dolphins, pelicans, sea gulls and numerous other bird species all feeding on an abundance of bait fish close to shore. It’s common to see the mists of whale spouts rising above the sea from the shore just south of Princeton Harbor at Surfer’s Beach. Lucky whale worshiping people like me have also seen lunge feeding, spy hopping and occasionally breaching. A spyhopping whale imitates a periscope. A brief definition of these behaviors is appropriate to frame the experience I had on July 9th a few hundred yards off the beach on a warm sunny day with a light breeze. Lunge feeding is when one or more humpbacks surface vertically with their mouths open, filling their lower mouth area with large volumes of water that contain fish or krill. The water is then pressed up to the upper jaw which closes while it squeezes the water and food through the baleen attached to the upper jaw, capturing the food. At times two or more whales will surface side by side lunge feeding. This sight elicits squeals of delight from dozens of people standing on the shore or in a boat with cameras, binoculars and cell phones. Spy hopping is when the whale rises vertically straight out of the water, mouth closed, allowing the individual to literally see what is above the surface. This behavior is more common in less clear water when it is more difficult to for the whale to see. Breaching is of course when a whale leaps fully out of the water, landing with a loud splash. Lunge feeding. Note the open jaws. 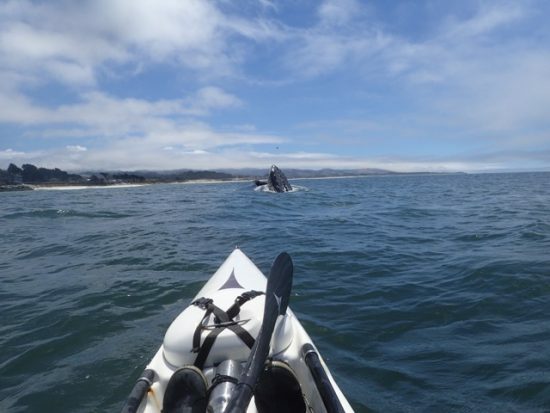 Many people who paddled kayaks out of Moss Landing in Monterey Bay witnessed whales doing this in the summer and fall of 2015 when large numbers of whales took up residence in the Bay. 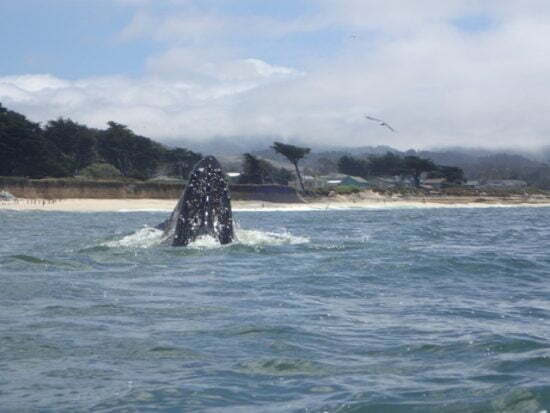 I spent several afternoons observing this wondrous spectacle in my Tsunami X-15 kayak, always seeking to maintain the appropriate and legal distance of 100 yards from the marine mammals. Whales of course choose their own path and my fellow Tsunami Ranger, Scott Becklund and I had whales surface and dive at times within a few feet of our motionless kayaks. It is especially interesting that the epicenter of whale activity south of Princeton Harbor was directly in front of the elder Tsunami Ranger Michael Powers’ house. It’s almost as if the breaching, feeding, and magic of these beautiful and mystical sea creatures were being summoned by the Viking architecture that is a local landmark and part of the fabric of Miramar Beach. One day I had just returned to Michael’s house after our weekly ritual 6-mile hike among the redwoods in the Purissima Open Space Reserve and when we got out of the car we saw many whales lunging and spy hopping close to shore. I went home, collected my X-15 wash deck kayak and launched just north of the Miramar Beach Inn. There were also a few people on paddle boards just outside the lines of surfers. I launched through very small surf, paddled out about 75 yards and began to take in the spectacle with an elevated heartbeat, soul awakened and camera tethered to my life vest. Within a few minutes a whale rose out of the water lunge feeding right next to a person on a paddle board. Shortly after that two whales surfaced lunge feeding close to several surfers who also were elated by the close proximity of these leviathans. I paddled around for about 2 hours and took photographs up and down the “alley” of whales who were spy hopping and lunge feeding on a regular basis. 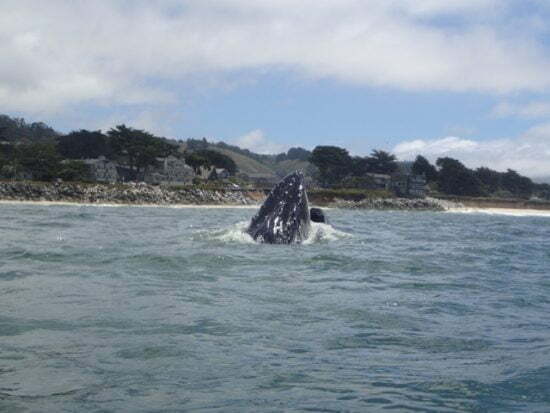 I had paddled south a bit toward Half Moon Bay when I saw a whale blow about 100 yards away. I paused as it appeared it was heading in my direction. I hoped to take another photograph when she or he surfaced to breathe. It’s always fun trying to hold position while capturing that great photo op! Then the whale gracefully and silently lifted out of the water perpendicular to me and placed his upper jaw across the cockpit of my kayak and lowered his upper jaw onto my thigh across the boat, pinning my leg very hard, essentially squeezing down as they do to force water and fish through the baleen. It did not work of course as his lower jaw was stuck on my hull. It hurt quite a bit and I was clamped briefly onto my kayak (I could have tickled its baleen) until he released and slid back into the water, rolling me out of the kayak and capsizing me. I flipped the boat up and climbed back in. My thigh really hurt and I thought maybe it was broken. As I got into the cockpit I noticed a small fish in my foot pedal area, clearly part of what the whale was trying to eat; at least that was what he first thought. I was alone and could not quite believe what had just happened. I was able to move and bend my leg, so it was not broken but I was in a lot of pain. It took 15 minutes or so for the pain to subside. I did have a cold “first aid” beer in my boat, so I drank it and continued following and photographing the whales for another hour. When I got home my leg was bruised underneath and around the knee, and was stiff and painful for the next 5 days, but it got better so no permanent damage I believe. I went to yoga class and was able to do most of the Vinyasa postures, so things looked good. I did take my daughter Lena and her friend out the next day. There was a lot of wind but we saw many whales feeding again all in front of Michael’s house up and down the beach close to shore! All quite remarkable. I do feel a powerful affinity and animation with these gentle and majestic giants. Of course many ocean kayakers have had the great pleasure of being in the presence of various species of whales and other marine mammals. 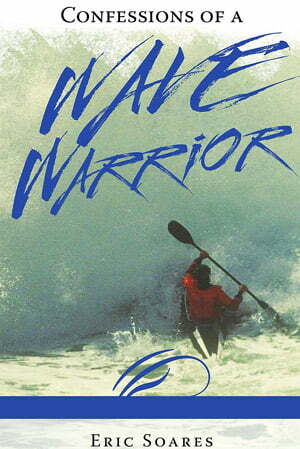 It’s part of the magic and mystery of open ocean kayaking. But I think my experience is unique. 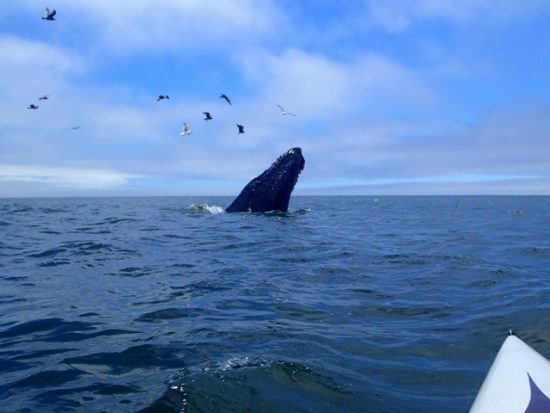 A humpback whale did breach last October in Monterey Bay and land on a double kayak, startling but not injuring the two paddlers who were on a tour to view the profusion of whales in the bay last summer and fall. But so far no one has reported being bitten by a whale. One of the great privileges of sea kayaking is the opportunity to witness such miracles. 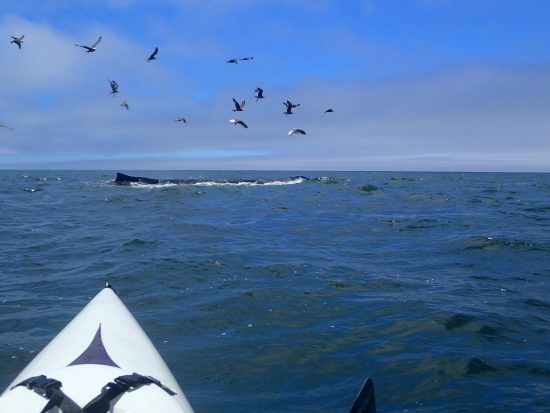 Paddling among whales is likely safer when they are not lunge feeding or breaching. When they are lunge feeding it is wise to allow even more than the 100 yards of distance required by the Marine Mammal Protection Act. Question: I wonder if my white kayak in murky water may have looked like a fish ball or school of shimmering fish, so maybe darker kayaks are less likely to attract a lunge feeding whale? 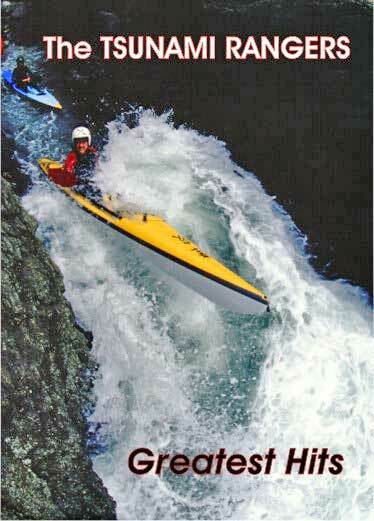 Are dark kayaks safer? 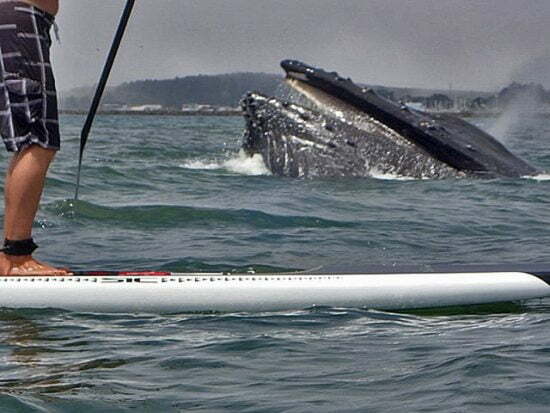 Don’t watch movies like “The Shallows” (which I did the week before the event) before having a whale engage you and your kayak in a case of mistaken identity. This movie shows a very persistent great white shark chewing up metal buoy. To a kayaker, it’s unnerving. 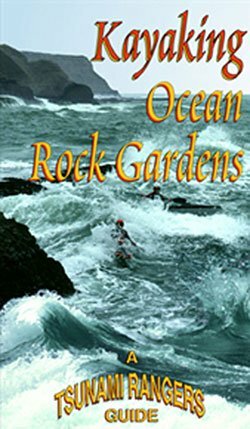 Finally, as member of the Tsunami Rangers I have been trained in a variety of ocean kayaking skills and have always been taught that anything can happen on the ocean. But I have not found an account of this sort by a kayaker in the literature yet. I did however, find a video of two divers who were nearly swallowed by two large adult lunge feeding humpbacks, missing then by a few feet only a couple of yards from their boat. I have a deep respect for these majestic marine mammals. I have no desire to cause them any stress as they enjoy the richness of the waters around Half Moon Bay. In the future I will stay back well beyond the 100 yard limit, and I will exercise even more caution when they are lunge feeding! Want to see some video footage of this amazing event? 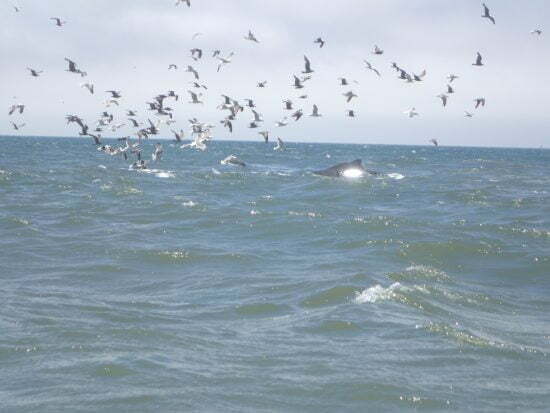 Check it out at: http://abc7news.com/society/whale-watchers-flock-to-pacifica-for-stunning-show/1410951/?cid=abcn_fb and feel free to share your close encounters with marine mammals below! Having paddled with Steve amongst whales , I feel he explained his respect for them and the laws that protect. I would like to add, he and I also discussed the 100 yard law as well as the more broad , to not influence their behavior. Steve really takes this to heart with the exception of placing himself in a position that might allow a better incounter. Like the trip a couple of miles offshore out of Moss Landing that he swam/floated away from his kayak for extended times. While tiring not to anthropomophize their behavior, I believe they were curious to the point that several altered course to swim directly to him. This would seem to influence their behavior but is this too extreme an example to be beyound the intend of the law. As fellow animals on this big ball, I want to be allowed to enjoy both it waters and creatures with respect.